A Beating Retreat performed by The Massed Pipes and Drums of the ACF and ATC (Air Training Corps) provided a fitting end to the Queen’s Diamond Jubilee Garden Party at Balmoral Castle, Balmoral Estate, Aberdeenshire on August 7, 2012. Her Majesty, who very much enjoyed the visit of the Cadet Pipes and Drums to Balmoral in 2010 as part of Cadet150, was on record saying how pleased she was that the cadets were returning to Balmoral. 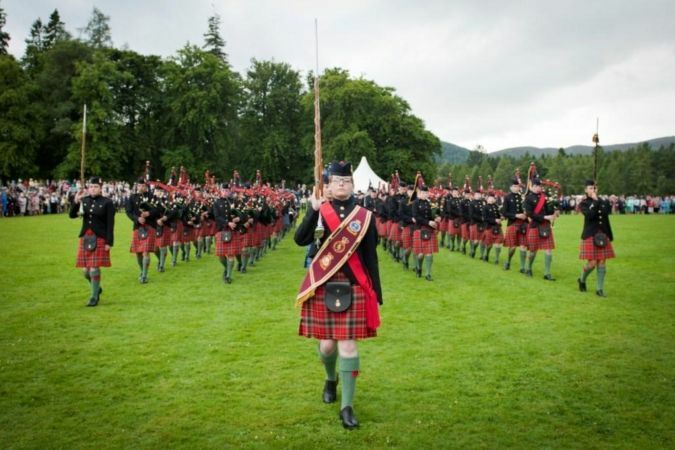 A total of 93 Cadet Force pipers and drummers were on parade as Her Majesty, The Duke of Edinburgh, the Earl and Countess of Wessex, a number of Lord Lieutenants and more than 3,000 invited guests witnessed a first-class Beating of Retreat on the lawn in front of Balmoral Castle – a truly magical setting. This was the final event of celebration of the Queen’s Diamond Jubilee and it was entirely fitting that it was carried out by cadets on the lawn of Her Majesty’s favourite Scottish residence. Cadets and adult volunteers from as far and wide as Orkney and Benbecula to Kent gathered at 2 Highlanders Bn ACF Cadet Training Centre, Boddam on Sunday August 5 under the direction of Major Jim Stout, National Cadet Piping Executive Officer. Monday saw the band being rehearsed under the guidance of Captain Brian Elrick, the Chief Instructor and Major Stout. Final preparations took place on Tuesday morning. 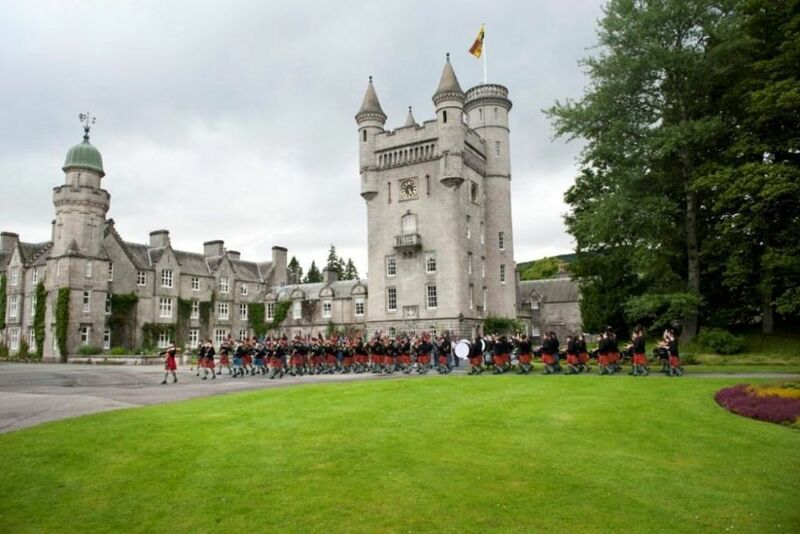 The Band travelled the 80 miles from Boddam to Balmoral Castle through torrential rain; however, the spirits couldn’t be dampened with such a prestigious event looming. At 5.25pm Cadet Drum Major Sophie Matheson, 1 Highlanders Bn ACF gave the command to step off as the 3,000 guests gathered around the parade area, marked out by The Royal Company of Archers, the Queen’s bodyguard whilst she is in residence in Scotland. The magnificent sight of the Pipes and Drums emerged from behind the tree line and a superb 30-minute performance followed, led by Drum Major Matheson and Cadet Pipe Major Andrew Allison, West Lowland Bn ACF. Drum Major Matheson requested permission from Her Majesty to march the Massed Pipes and Drums off parade and so they did to rapturous applause as the sound of Scotland The Brave faded behind the tree line. “This is not something you do every day and it’s extremely exciting. I would not get this opportunity anywhere else. I wasn’t nervous at all when I asked The Queen’s permission to march the Massed Band off parade; in fact, I was quite excited. I’m really looking forward to the Berlin Tattoo in November.” Cadet Drum Major Sophie Matheson. “This was a great opportunity and an honour to play for The Queen at Balmoral Castle. I am so lucky to be involved in cadet force piping and drumming and I would never get this type of opportunity if I wasn’t. We have the Berlin Tattoo in November and I’m really looking forward to that as well.” Cadet Pipe Major Isla Stout.